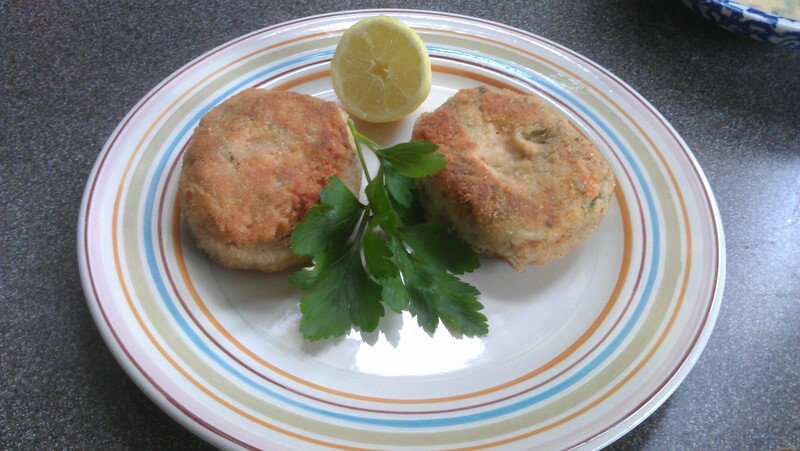 These have got to be one of the easiest fish cakes around. I love salmon (as you can tell from the many salmon recipes I’ve already blogged) and this is a nice way to have it. I’ll definitely make them again. They have a really delicate taste. I saw the recipe on the BBC Good food magazine and , as they looked rather appealing and pretty straightforward to make, I decided to try them out. I steamed the fresh salmon using the Jamie Oliver tip which is to wrap the salmon fillet in foil together with some herbs and pop them on top of the potatoes while they are steaming (for the last ten minutes). It worked a treat. Of course you can poach the salmon, if you wish, or even cook it in the microwave. Only make sure not to overcook it. In fact it should still be a bit pinkish in the middle. 1.Steam the potatoes. Drain and leave to steam-dry, then mash. Meanwhile cook the salmon (grill, poach, or use the method I mentioned). Cool for a few mins, then break into large flakes. 2. Mix the potato, mustard, lemon zest, herbs and some seasoning. Lightly mix in the salmon, taking care not to break it up too much. Shape into 4 large fish cakes or 6 smaller ones. 3. Put the flour, egg and breadcrumbs in 3 shallow dishes. Dip the cakes into the flour, dust off any excess, then dip in the egg, and finally coat in breadcrumbs. Heat the oil in a large pan. Fry the cakes over a medium-low heat for 3-4 mins each side until deep golden and heated through. Buonissime, anche se le ho fatte con la trota salmonata. Questo avevo nel frigo.